Delicious and dark sticky toffee pudding. No sharesies. Mmmmm pudding. Sticky toffee pudding, no less. Three little words that bring a whole lot of happy. Naturally, I'm even happier when this hypothetical sticky toffee pudding is homemade. Homemade equals extra sticky, extra spongey and an extra healthy portion. With custard. And it's warm. I apologise in advance for the dribble. I don't always have time to make my own sticky toffee delight of a pudding, but shop-bought ones are no fun in comparison. Thankfully, I've discovered the Cartmel Village Shop. They've been going for twenty years and yet still their puddings are ALL homemade. They're a family-owned shop in Cumbria who makes all sorts of sticky delights with 100% natural ingredients and a whole lotta love. Iam blatantly going to eat this straight out the jar. They haven't stopped at sticky toffee pud - oh no. 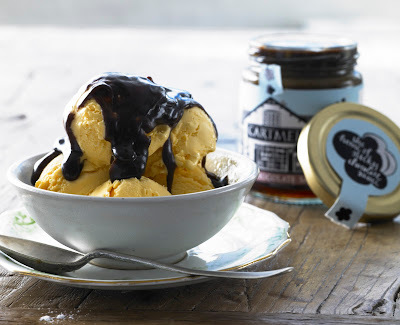 They now also do such treasures as sticky chocolate, sticky ginger, and sticky banana pudding, not to mention their sticky sauces and sticky toffee chocolates. 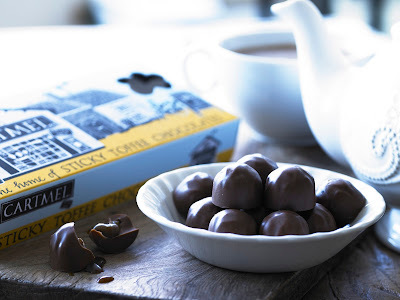 The chocolates are filled with the sticky toffee sauce. Yeah, I know. If you're really dedicated to your love of puddingy goodness, they also do a year-long Pudding Club. You get one of their family-sized (that's four servings minimum) puddings per month to any UK mainland address. It's £102.50, which may seem steep but is less than £9 per month for a large homemade pud including delivery. I know it's six-months early, but I'm definitely adding this to my Christmas wishlist. Good God, this is all shades of frickin' amazing! Haha, glad you think so! I literally can't decide which one to buy next. 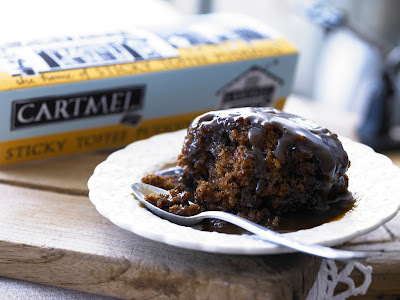 I am such a fan of the Cartmel puddings! Discovered them in their Cartmel shop whilst at Lancaster Uni. You can pick them up at the fabulous Tebay services on the M6 too!! In that I'm not driving that far in the near future, I'm going to have to order a large one now I've read your post! !